Cyber Huntsville is a 501(c)(6) non-profit organization made up of industry, government and academic institutions dedicated to making Huntsville and the Tennessee Valley region a nationally and internationally recognized cyber leader. Our organization and experienced members focus in the areas of systems engineering, research and development, modeling and simulation, cyber security, experimentation, and test and evaluation. In 2010, Huntsville Mayor, Tommy Battle, started a conversation among government, industry, and academic leaders about leveraging Huntsville’s technical expertise and leadership to help with the local, regional, and national cyber challenge. In August of 2010, Mayor Battle formally announced the start of the Cyber Huntsville initiative. Since 2010, we have been a driving force in creating cyber progress for the Tennessee Valley. Cyber Huntsville is funded by our membership and our profits from joint sponsorship of the annual Cyber Summit. Please join us in growing the Tennessee Valley into an unmatched Center of Cyber Excellence. Cyber Huntsville is an all-volunteer organization populated with outstanding, totally committed and very hard working leaders from all walks of life. Industry (both Commercial and Defense), Academia (K-12 through University) and Government (Federal, State and Municipal) are all represented. 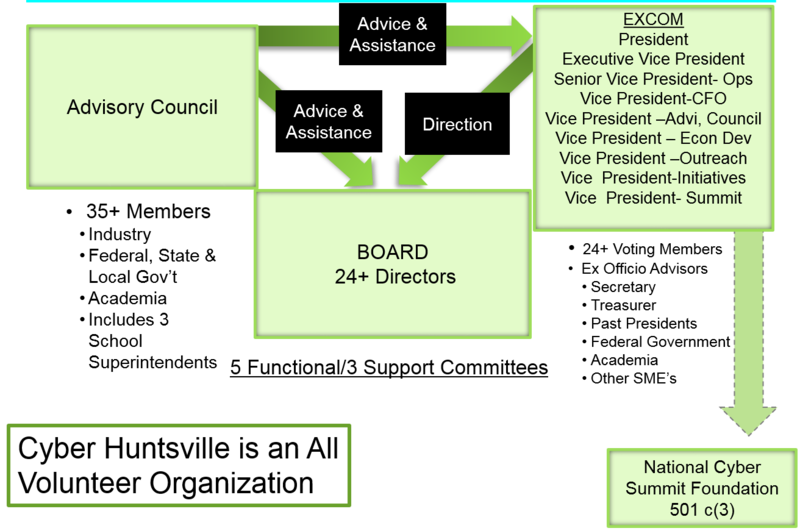 Our Advisory Council is led by a President (currently a Retired US Army Major General) and composed of senior (CEO/Executive/Senior VP) representatives from our Sustaining Members (highest level Corporate Membership) and several senior at-large members from Industry, Government and Academia. Our Advisory Council Meets quarterly where they receive the most current information on and discuss Cyber Huntsville activities and needs. In addition to the quarterly meetings, Advisory Council Members are also routinely invited to other special events and are consulted with throughout each year, where they provide relevant, high-quality advice and guidance to the Cyber Huntsville Board of Directors. Our Board of Directors is a true working board composed of about 30 voting and non-voting (ex-officio) members. Board members are nominated both individually and by Sustaining Members and are elected by the sitting voting BoD Members for 3-year terms. These terms are staggered so that no more that a third of BoD positions are open on an annual basis. Each voting BoD Member is either the Director or Deputy Director of one of Cyber Huntsville’s eight Committees or is a more senior VP and Member of the Executive Committee. The BoD meets monthly, normally on the last Friday of every month. Our Executive Committee includes the nine most senior members of the Cyber Huntsville Board of Directors. The EXCOM meets monthly, normally 2-3 days in advance of Cyber Huntsville Board of Directors Meetings. The EXCOM has decision-making authorities delineated in our by-laws and is the final detailed preparation session in advance of each Board of Directors Meeting. Our Committees are divided into eight focus areas: Economic Development, New Initiatives, Education, Workforce Development, Exercises, Membership, Marketing and Events. These committees are led and managed by the BoD are the vehicles through which many Cyber Huntsville initiatives are managed.